EVE players can win a decommissioned police cruiser for their efforts in helping science. EVE Online has taken a step out off of the science fiction stage and into the realm of real-world astronomy: Right now, thousands of EVE players are digging through gigabytes of raw scientific data, scouring the Milky Way for evidence of distant planets. Project Discovery, a collaborative project between CCP Games, Massively Multiplayer Online Science (MMOS), and the University of Geneva, aims to use EVE’s playerbase to locate, identify and catalog real life planets outside the bounds of our own solar system. By quantifying scientific data provided by the Keplar Satellite telescope, EVE players can save university scholars hundreds of thousands of hours of work, and potentially advance their research by several years. CCP announced the project at its annual Fanfest in April, and it’s now officially live in the game. Thinking of embarking on a search for alien life? Here’s how it all works. When a player first opens Project Discovery, they are greeted by the digital manifestation of Professor Michel Mayor of the University of Geneva. The digital professor prepares the player by leading a brief interactive tutorial that teaches the scientific concepts in play that can determine where the exoplanets may be found. Once the tutorial is completed, players are presented with as much data as they want to simulate, manipulate and catalog. By crowdsourcing such a massive amount of data, university professors and students are freed from the lowest level tasks of identifying these alien worlds, and allowed to focus specifically on data sets where a planet may exist. Of course, nothing in EVE’s universe is truly free, especially not labor. Even a task as noble as furthering humanity’s exploration of the stars must provide a return on investment to the EVE community. To ensure player participation, CCP is offering a wide variety of unique rewards alongside Project Discovery. By completing tasks inside the system, players are able to earn experience points to advance through a new leveling system. As an incentive bonus, the more accurate your results are over time, the more experience you are awarded, allowing those with a keen eye to advance faster. As you level up, you are awarded skins for a wide variety of ships, clothing to spruce up your avatar, and, very rarely, with one of two unique ships. 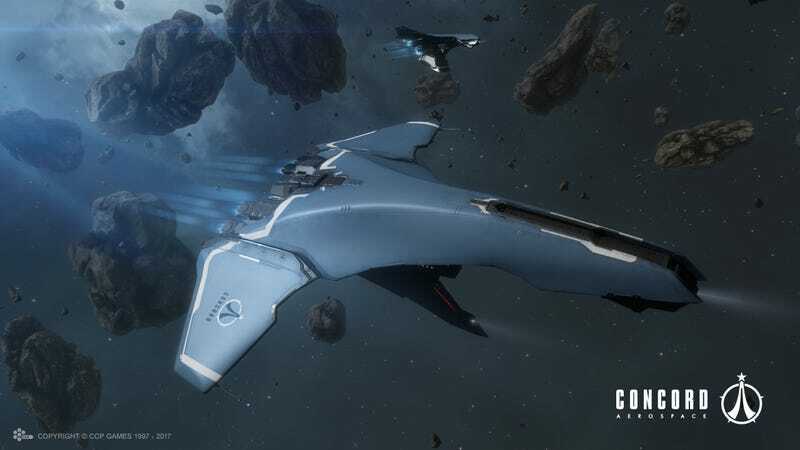 The ships in question cannot currently be acquired through any other in-game method, and belong to EVE’s space police faction, called CONCORD. The desire to pilot a decommissioned police cruiser runs deep in the collective hearts of EVE pilots, and these ships are sure to remain very valuable for the near future. In addition to being fiscally rewarding, the system has been engineered to feel rewarding and fun. Project Discovery seems to tick all of the right boxes when it comes to rewarding feedback. Between its EXP system, frequent loot boxes, and instant results—not to mention the inherent draw to any Sci-Fi fan of potentially being able to discover a planet, Project Discovery kept me enthralled for several hours of “article research” without me even realizing it. Unfortunately, the launch of Project Discovery has run into one setback. According to quality assurance analyst CCP Sledgehammer, the scaling difficulty mechanism, which is supposed to increase alongside a player’s skill, is not functioning correctly. This is causing some players to get stuck into a near-infinite loop of the most difficult data sets. I personally failed to identify the planetary transits in so many of the calibration data sets that two of my characters were locked out of rewards until their accuracy improved. Fortunately, CCP is aware of the bug, and will be not only fixing it, but also resetting players’ accuracy scores during their daily downtime. This means I’ll be able to try my hand at citizen science again tomorrow, without permanently damaging humanity’s chances at finding other worlds among the stars. Project Discovery represents the continued effort of people all over the world to harness the collective brain power that is more and more being focused towards video games. It allows the players of the game to user their leisure time to not only relax, but to, in some small way, further our collective knowledge as a species. I look forward to taking the time to scour the stars from the seat of my virtual space ship and, just maybe, having a small hand in finding another planet somewhere out in the vast void of space.